Suggested Usage: Adults: take ½ tsp (1,700 mg) 3 times daily mixed with 250 mL of water, tomato or fruit juice; take with food. Avoid taking at bedtime. Use for a minimum of 4 weeks to see beneficial effects. 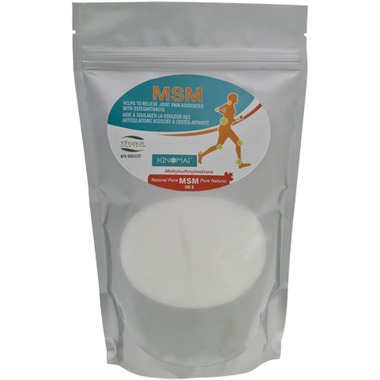 Ingredients: MSM (Methylsulfonylmethane) Pure white crystalline. Cautions: Consult a health care practitioner if symptoms worsen. Consult a health care practitioner prior to use if you are pregnant or breastfeeding. Some people may experience mild gastrointestinal bloating, constipation or indigestion. Do not use if the seal is broken. Store away from children. Store at room temperature. I put it in a glass of pomegranate juice diluted with sparkling water (or straight water when out of sparkling). Easily dissolves. Honestly have no idea itâ€™s even in the drink! Great product, I found it didn't take long to feel a difference. Was worried about the taste, and read a lot of reviews about MSM tasting awful, found that it wasn't that bad at all. Will purchase again.